We are surrounded by stories. Whether it's daily gossip about happenings in the neighborhood to reports on the evening news, it's nearly impossible to go through one's day without hearing a tale. What is more rare, though, is happening upon stories that change the way we think or our outlook on the world. Stories that touch us at our very core, acting as a catalyst for something new. I've been reflecting a lot lately on these types of stories. With both Beats exploring stories from my childhood on the heels of a lot of change in my own life, I've been picking through the ones I know have shaped me, acting as roadmaps during times of uncertainty. The underlying themes of these stories has been one of perseverance and strength, even in the face of massive opposition. Yet there's always a special element too. Something that sets them apart and often transports us into those same stories, making us one with them. 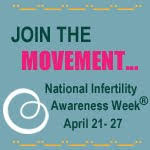 A few weeks ago with NIAW, I found myself once again reading lots of stories about journeys through infertility. Most of these stories I am very familiar with, as I've read along and supported these amazing authors. Others were new to me, but still left me nodding along and feeling familiar aches. In general, a common theme emerged: one of survival during a trauma that turns life upside down. Though each path is unique, every author talked about the importance of finding support for their journey and finding their own road to resolution along the way. All of these are powerful stories. All the messages were very important. Reading all these stories brought me back to my own time in the trenches and the bloggers that kept me going. Initially, I found myself gravitating only to those who were in treatment and finding resolution through pregnancy. But as time went on, I started to expand my reading list to those who were finding other roads to resolution. And their stories changed not only my outlook on those paths, but also spurred some serious self reflection that catalyzed some life-changing decisions in other aspects of my life. Their stories laid new foundation for my own road to resolution. Back in February, following my post about wanting to find ways to advocate, Pamela contacted me. She told me about a new book she was working on and shared a draft with me, asking me to take a look. What originally started as a promise to Grey that I would only need 30 mins quickly turned into 3 hours of reading and rereading Pamela's work, nodding along and pausing to reflect on thoughts and feelings that resurfaced through each of her chapters. But most importantly, I found myself shocked when I came upon the section about how society views women who are not parenting after infertility and realizing that prior to infertility I too believed these myths and how it's thanks to women like Pamela, Loribeth and Mali that I no longer do. The core element of stories that change us is that the touch on truths that society wants to repress. For those of us living with infertility, the idea that living a full life after infertility without parenting is one that many consider impossible. And yet, the myth of this impossibility is damaging. I firmly believe that everyone living with infertility should be given options and opportunities to grow their families. But I also believe that our society also needs to recognize that there is more than one road to resolution and each road is an individual as the players involved. Pamela's new book "Finally Heard: A Silent Sorority Finds its Voice," addresses all the above. Newly released (and I encourage you read it), Pamela goes beyond the emotional aspects of the infertility diagnosis and finding oneself at the end of treatments without a baby, bravely tackles both society's view of those living without children as well as the dark-side of an unregulated fertility industry. Though this last part is definitely unpopular, the message that Pamela brings is important for anyone who decides to pursue treatments to consider. Regardless of where you are in your journey, there will always be stories that help you move through the mile-markers. Some stories will provide inspiration to take those first steps down a path while others will have you stopping in your tracks and re-evaluating your path. These are the stories that change us. I think you bring up a really interesting point… even within the infertility community, we silence these sisters. As no one in the trenches of treatment wants that to be their story (or they wouldn't be in the trenches to begin with), we all try to ignore it. Like if I throw a sheet over this GIANT issue and this ENTIRE group of people, it won't become my reality. To acknowledge seems somehow connected to accepting. Interestingly enough, I think the same is also true of adoption, if to a lesser degree. Everyone is so sick of being asked if they've thought of adoption and so frustrated with anecdotal stories about adoption leading to pregnancy, that when an infertile sister turns from treatment to adoption, it ofter feels like giving up… abandoning the sisterhood… admitting that adoption is a valid choice… and maybe worst of all, giving credence to all of those who asked us or pointed us to adoption in the past. It's an interesting little sisterhood within the infertility world. I'm certainly thankful to have those who have made similar choices to me, as it's always nice to feel like you're in good company, but even more, I'm thankful for those who chose another way. I think it stretches us to acknowledge that there is more than one way out of the pit. And maybe most importantly, it's necessary to remember that happiness CAN be found in ways that we may originally not have believed. Just finished reading Pamela's book & hope to review it on my blog soon. So glad she is continuing to write about these issues, unpopular though they may be in some quarters. The more we write and speak our personal truths about childless/free life (by choice or otherwise), the harder it becomes for others to ignore and to rely on old stereotypes -- and the same goes for the broader ALI community. Thank you, Cristy, for being a bridge between the different parts of the ALI world! I have to apologise. I read this when you first posted it, but couldn't respond properly on whichever device I first saw it. So I am coming to this rather late. You're right of course, that Pamela's comments on the infertility industry might not be popular. People who are still trying to conceive, who still have hope and faith in the industry, will not appreciate her insights. It's natural to be defensive, especially of a process to which you are so deeply committed. And I suspect that those who got the outcome (baby/babies) they wanted could not bring themselves to critique the industry, simply because it might seem a betrayal of those much-loved children. But I am so glad Pamela speaks out. And as Loribeth said, that there are a few wise women who keep an open mind, and build bridges between us.